These have proved to be very popular by both the kids and also the parents. Of course as a parent you could co-ordinate the border colours with the child's bedroom colour scheme! What I have designed are interactive wall friezes. The focus sounds come off. Here is an example although obviously there are something like 75 of them in total! Each word is decodable by the child, at each step, after the introduction of the sound 'p'. 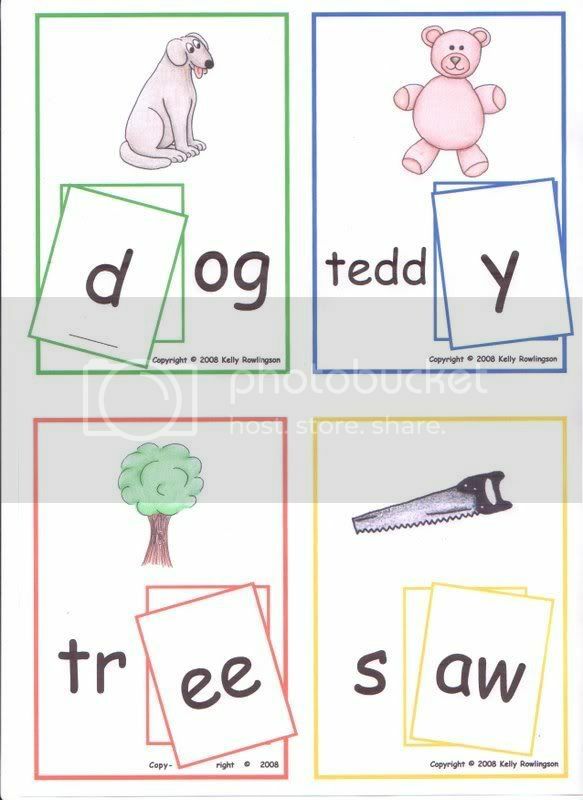 They are decodable after 'p' only because I was trying to find words for the alphabet sounds with the correct initial sound. However, this is easily changed if the sounds can be anywhere in the word. That is soooooooo much easier! Anyway, if anyone wants a copy send me a note! I suppose I could also change them to fit with Jolly Phonics (or other products) order of sound introduction. That is if you were really, really nice to me. I haven't looked on the decodables forum for a long time so I didn't see your posts before. I really like these wall-friezes. Is it too late to ask for you to send me a copy? Thanks for the idea in any case! Sorry for the delay. Just PM me your email address and I will send the PDF files to you.